Jack Dunn slides in safely to second base. The junior shortstop walked off Friday’s win against Iowa. Heading into this weekend’s series at Miller Park, Iowa and Northwestern were trending in two different directions. The Hawkeyes (29-18, 10-9 Big Ten) were coming off a resume-boosting series win over Big 12 leader No. 22 Oklahoma State, while the Wildcats (16-29, 6-18) had dropped three straight at Purdue last weekend. But after a back-and-forth, extra-inning win Friday and a shutout victory Saturday, NU took two-of-three games from Iowa to win its final Big Ten series of the season. Junior shortstop Jack Dunn capped off Friday’s game — which senior catcher Jack Claeys called the “hands-down craziest game” in his college career — in the bottom of the 10th inning. After a strikeout to start the inning, sophomore pinch hitter Kyle Burnett Jr. walked and sophomore left fielder Leo Kaplan singled to get two runners on base. Freshman right fielder Casey O’Laughlin then moved the runners over with a groundout. That left the game in Dunn’s hands. On a 0-1 pitch, Dunn hit a ball up the middle that deflected off the glove of the Hawkeyes’ second baseman Mitchell Boe as sophomore pinch runner Nick Paciorek and Kaplan scored to give the Cats the 7-6 victory. On the mound, freshman lefty Quinn Lavelle went 6.2 innings while striking out five and giving up only 2 earned runs. Senior Tommy Bordignon relieved Lavelle and struck out all four of the batters he faced over 1.1 innings. In addition to being solid on the mound, Lavelle and Bordignon showed prowess in the batter’s box. An injury to sophomore third baseman Charlie Maxwell resulted in NU losing the DH spot in the lineup, which meant the pitchers had to hit in Maxwell’s spot in the lineup. Lavelle roped a double into the right-center gap in the fifth inning while Bordignon hit a bloop single in the seventh. “We actually took (batting practice) about a month ago and (Quinn) actually put a couple out so we weren’t totally shocked, but to do it in a game off of 90 mph, that’s a different thing,” coach Spencer Allen said. The game featured five lead changes and four ties. The Cats took their first lead in the sixth when a solo home run from Claeys put NU up 2-1. Junior center fielder Ben Dickey later tied the game at 3 with a solo shot of his own. The Cats took their second lead in the eighth on a wild pitch and a balk. Saturday’s 4-0 win was highlighted by an outstanding performance from sophomore right-hander Hank Christie. Christie put in arguably his best performance of the spring, as he went seven shutout innings and allowed only six baserunners, despite having to deal with an extended rain delay in the third inning. In addition to shutting out Iowa for only the fourth time this spring, Christie and senior reliever Richard Fordon held the Hawkeyes’ three top hitters — Tyler Cropley, Robert Neustrom and Chris Whelan — hitless for the first time in a game this season. 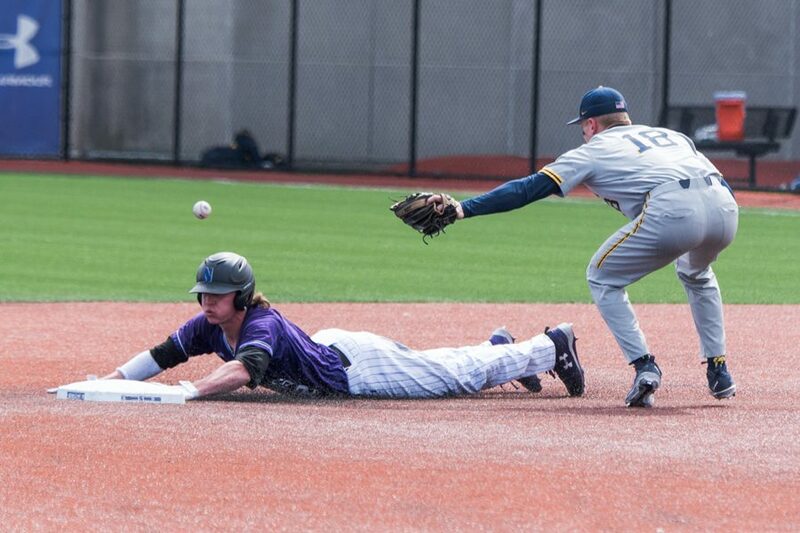 At the plate, senior Connor Lind was the engine for NU. The North Carolina native had three hits, including a 2-RBI single in the first and another RBI single in the third. In Sunday’s series finale, Iowa got out to an early lead, but the Cats managed to come back and take a 3-2 lead in the third inning. However, Iowa scored 6 straight runs over four innings to put the game out of reach. Despite falling behind, the Cats continued to work and put pressure on Iowa. A Claeys 3-run homer in the ninth made it a 10-7 ballgame and forced the Hawkeyes to bring on closer Zach Daniels for the save. After starting the season 1-14 in conference, NU went 5-4 over the last three weekends of conference play. Offensively, the Cats scored 5.9 runs a game over that nine-game stretch compared to 2.6 runs in their first 15 Big Ten matchups.